Eugene and I have been making an effort to try out different restaurants in our uptown neighborhood. In NYC, the downtown places always get all the attention (and many with good reason! ), but there are also a lot of incredible places located near us in Washington Heights. Last weekend we took advantage of the gorgeous (albeit definitely concerning) freak spring weather to enjoy an early dinner at a nearby spot called The Pandering Pig. It's a cute little place with only about 10 tables and a small multitasking staff. I was pretty impressed with their salad options, which went beyond the salad greens to offer a variety of roasted vegetable options. Eugene chose a roasted cauliflower salad, while I went with the roasted carrot choice. And it was so lovely! 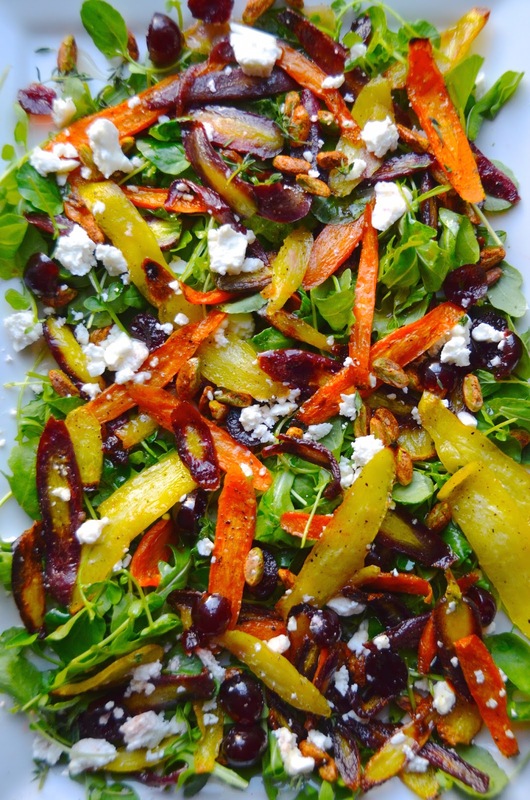 A pile of greens topped with thinly sliced roasted carrots, nuts, dried fruit, crumbled cheese, and a lovely vinaigrette. It was just one of those super satisfying combinations of flavors that I was instantly inspired to recreate. And here we are! This is not the same salad I ate there, though it's clearly a riff on that dish. Sweet, spicy, salty, crunchy, tangy--all the things a well-balanced salad should be. I tend to get lazy with my salads at home, so it was great to have the reminder that just an extra step or two can turn a blah salad into an incredible one! Preheat oven to 425 degrees. Pull out two baking sheets. Wash, peel, and trim carrots, then use a knife or a mandoline to cut 1/2-inch thick slices on a diagonal all the way up the carrot (You're looking for a long narrow oval shape). Repeat with all the carrots. 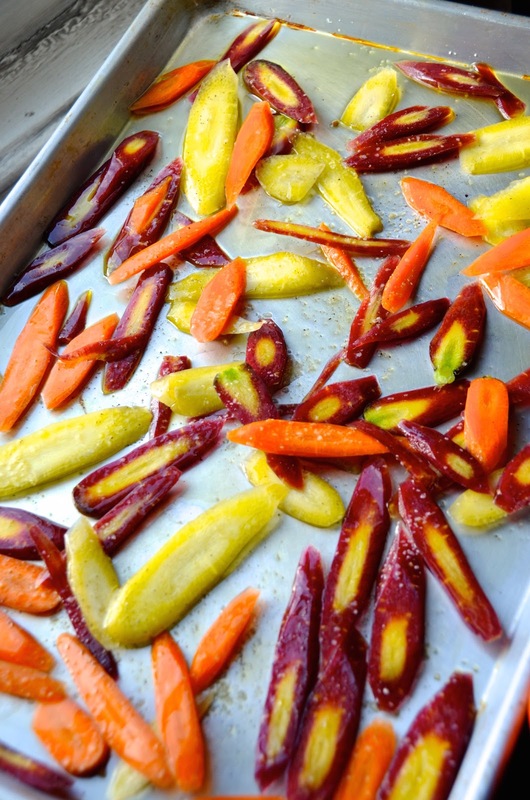 Divide carrots onto two baking pans and drizzle liberally with olive oil, salt and pepper. Toss to coat then spread out onto a single layer per pan. Roast about 20 - 30 minutes, tossing once, until carrots are slightly charred. To build salad: Place arugula, pistachios, and cherries in a large bowl. Drizzle with olive oil and red wine vinegar, then toss to coat. 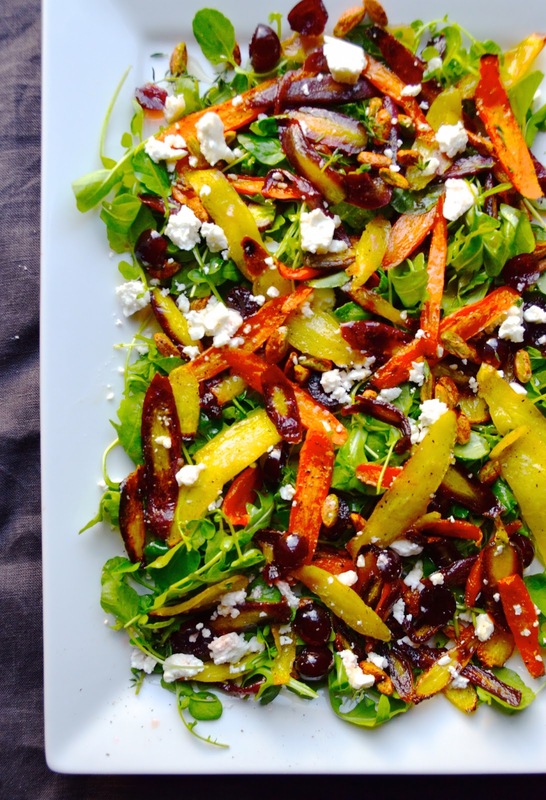 Place greens on a large platter then top with roasted carrots and crumbled feta cheese, then drizzle top with honey. Serve warm or room temperature.